American author Henry James wrote a short story in 1900 in which protagonist George Dane, a successful author (and as most surmise, James’ alter ego), dreams of a ‘great good place’ far from the busy day to day trappings of reading, writing and responsibilities. AKA, what today’s generation would label #firstworldproblems! Sociologist Roy Oldenburg borrowed the term for the title of his influential book The Great Good Place: Cafes, Coffee Shops, Bookstores, Bars, Hair Salons, and Other Hangouts at the Heart of a Community, a treatise on the human need for third places for congregation and happiness. Oldenburg found communal bliss in places like pubs, cafes and libraries. Villanova University Class of 2015, we hope you remember Falvey as a great, good place. Photo by Joanne Quinn. 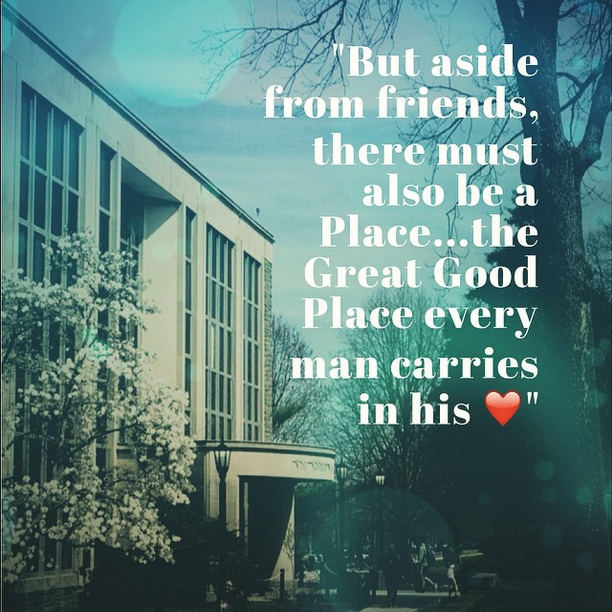 Follow the library on Instagram @falveylibrary.